Last week I attended the Eco-city World Summit in Melbourne. On Friday, permaculture co-originator David Holmgren presented an ‘alternative keynote’ based on his forthcoming book RetroSuburbia. The session was arranged and chaired by Sam Alexander, Research Fellow in Sustainable Economy and Consumption with Summit co-organisers Melbourne Sustainable Society Institute. Sam invited me to join award winning landscape architect and urban designer Kate Dundas in responding briefly to David’s presentation. My brief was to drill down a little further into the energy context and implications for RetroSuburbia. RetroSuburbia builds on my Aussie St presentations showing how ordinary Australians can downshift and retrofit their houses, gardens and lifestyles to be much more sustainable and resilient (to survive and thrive energy descent futures). The lucky country is likely to get a big shake up from the bursting of the property bubble, the ongoing collapse of prices for Australian exports, more extreme weather events and geopolitical crises. Older homeowners without debt are worried about the future of their children and grandchildren. The incremental and ongoing retrofit of the built, biological and behavioural domains of the household is recognised by many as the best bet to weather the storms of uncertain times and contribute to a better future for the next generations. While concern about the future is a strong motivation for some downshifters, others are driven by the desire to get a better life now, respond to a health crisis or protect their children from media saturated lifestyles and toxic values. For many young (and middle aged) couples contemplating “settling down” and a family, the problem of how to get a home without massive mortgage debt, where they can be themselves, is a problem that needs more creative solutions. For many environmental activists struggling to find fulfilment in the battles to “stop the world we don’t want”, growing their own food and repurposing what others throw away, provides an oasis from which they can renew their energies and spirit for the “work” of trying to project those positive changes into their communities and the wider world. Whatever the motivations, a psycho-social space has emerged where the pioneers on this path can provide models for those searching for a better way of living. Re-evaluating the economic role of households is foundational for David’s thinking on RetroSuburbia, and it’s the implications of this on which my response focused. At face value it might seem like this is aimed at too small and local a scale to make a dent in the globe-spanning socio-ecological challenges humanity faces. 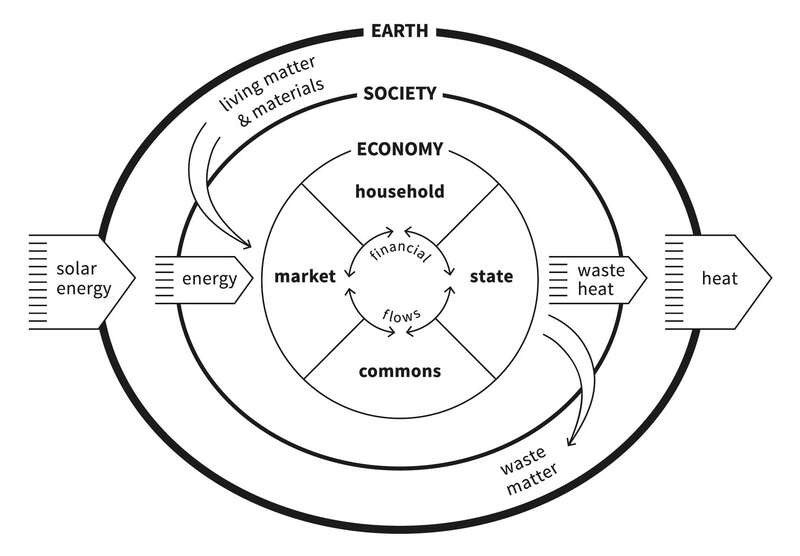 The Embedded Economy, from Doughnut Economics. Image source Kate Raworth and Marcia Mihotich. Incidentally, Kate recently featured in The Rescope Project’s Rescope Radio podcast episode #3 available here – highly recommended as an intro to her ideas and the experience informing them. A slightly edited and expanded version of my energy-centric response to David’s presentation follows. In light of the very confident views expressed in other Eco-city Summit sessions about the prospects for ‘100% renewable energy transition’, I think it’s important to underscore that David’s RetroSuburbia proposal is informed by a very different view of plausible energy futures than will come to mind for most people when they imagine low or even post-carbon societies. The cities we live in today are direct expressions of cheap, abundant and energy-dense fuels and electricity made available by the mass exploitation of fossil fuels. Without energy carriers of equivalent nature, cities as we currently know them could not function. They would be physically unviable. At the extreme of urban density found in city centres, this plays out in terms of the amount of physical work that’s needed to provide for material needs, to remove wastes, and to make high-rise buildings habitable. At the other extreme, vast sprawling dormitory suburbs add the need for mass-scale rapid movement of people over long distances. This obviously makes replacing fossil energy sources with low-emission alternatives central to any vision for eco-city transitions. It’s an increasingly mainstream view that this can and should involve supplying the full range and extent of energy services currently provided by coal, oil and natural gas with renewably-generated electricity, mainly from solar PV and wind. Feasibility thinking for the transition to renewably powered societies functionally equivalent to those we’re familiar with today tends to give a lot of weight to factors like the abundance of solar radiation relative to current energy use, and the rapid decline in the financial cost of PV systems. This is an essential starting point, but it’s based on a very abstract view of an extremely complex situation. What’s actually achievable in practice depends on a huge range of more detailed technical, economic, political, social and cultural questions. Once you start grappling with the implications of this, David’s case for RetroSuburbia really makes a lot of sense. Take for example the particularly thorny challenge of electrifying freight transport on a city-wide scale. Usually we’d try to deal with this in terms of technology and infrastructure change, and the policies needed to drive this. David’s proposal to restore the economic role of households offers a great example of the much wider possibilities that open up if we treat energy challenges first and foremost as social phenomena. There’s one major physical constraint associated with the transition to renewable energy that’s received far too little attention to date, and for which RetroSuburbia offers an especially interesting response. The constraint I have in mind relates to the power density of different energy sources. Power density is the rate at which energy is supplied or used per unit of land area. Supply chains for electricity and fuels from fossil sources achieve power densities ranging from hundreds up to thousands of watts per square metre. For equivalent renewable energy conversions on the other hand, power densities range from around 1 W/m2 for wind (and even less for biofuels), up to a maximum of around 20 W/m2 for rooftop solar PV. In comparison, industrial facilities use energy at the highest power densities, ranging from hundreds up to thousands of watts per square metre (W/m2). But the peak levels for the largest high-rise buildings are also in the order of thousands of watts per square metre, while annual averages for whole blocks in some city centres can be over 500 W/m2. Averages over entire city areas are in the order of 10 to 50 W/m2, and peak levels are considerably higher. This means that the land areas that cities currently require for energy supply are much smaller than the cities themselves. In a renewably-powered world on the other hand, this spatial relationship will be reversed. Cities as we currently know them would rely on vast hinterlands dedicated to capturing and concentrating flows of diffuse energy. A couple of key implications follow from this. First, it precludes futures in which urban densification and local energy self-sufficiency can coexist. Settlements with high population density will always rely on import of high-quality energy, which means a fixed dependence on complex industrial-scale systems. And second, even at suburban population densities, this places concrete limits on rates of local energy conversion that are well below present demand levels. In a world unconstrained by other limits this might not seem to be a major barrier to cleaner and greener versions of the cities we have now. Certainly in Australia, physical land availability isn’t a constraint, though even here the scale involved is great enough that conflicting land use claims can’t be ignored. In some locations though, the land areas involved in meeting projected future energy demand entirely from renewable sources can approach or even exceed entire national territories. Examples here include Japan and the United Kingdom. But the required massive infrastructure expansion comes at a time when economies around the world are already burdened by historically unprecedented debt. On top of this is the physical economic headwind of declining conventional petroleum production. And then there’s the economic impact of much higher financial costs for renewable energy supply at the overall system level, as distinct from declining costs for individual system components in isolation. This all points towards futures in which ways of life with far more modest energy demands have an adaptive advantage over the extremes that are typical in many cities today. And here the primarily social response of RetroSuburbia really seems to come into its own. There’s an obvious irony here, given that suburban living as we currently know it is often regarded as having perhaps the poorest prospects of any way of life in carbon-constrained futures. The resolution to this lies in recognising that the reduced energy demand that’s needed for the suburbs to work isn’t just a matter of doing the same things more efficiently. It’s really about living in the suburbs in very different ways—and in doing so, making current energy expectations obsolete. When I say that this will involve ‘more modest energy demands’, it’s not just reduced demand that I’m thinking of. This is also about using lower-quality energy sources such as our own muscle power, passive heating and natural air flows where these are sufficient to do the job. We’re moving towards futures where the high-quality energy provided by electricity and liquid fuels will be inherently more valuable than it is now, and this means it will need to be used more judiciously. Where people are prepared to embrace the implications of this by actively choosing to reduce reliance on fuels and electricity, there’s scope to make the transition task easier. But energy demand expectations are largely a function of the social and economic structures we’re embedded in. The amount of time spent away from the household is a factor with big implications here. If time in the household is scarce, then any work done there has to be accomplished faster, and this requires greater physical power. And so we use electricity and fuels to power machines, in order to amplify the power of our own labour. Take a petrol powered lawn mower versus a push mower as a very practical micro-example. A reasonably fit adult will take something like five times as long to do a given amount of work with a manual mower compared with a petrol powered mower. Where fuel’s cheap and time’s scarce, using the petrol powered mower’s a no-brainer. But this also assumes a world where well-kept lawns are a high priority. That’s obviously a world where not only is fuel cheap, but where there’s no incentive to put the land occupied by the lawn to productive use. If we’re still determined to maintain lawns, the fuel cost needs to increase dramatically before there’s a financial incentive to use a push mower. But if I convert the lawn area to grow food instead, then muscle power can be used to leverage sunlight, the hydrological cycle, and soil micro-biology for an economically-valuable yield. This displaces a little mower fuel, but a much larger amount of fuel for the commercial food production and transport that’s avoided. The quantities here might still be modest, but if this way of thinking is extended to other areas of economic life then the energy benefits start to compound. With an increasing proportion of economic needs being met close to home, there’s potential to set up a virtuous cycle that makes the local economy more viable overall. With this comes increasing potential to drive down demand for high-quality fuels and electricity. And as this demand is driven down, the proportion that can be met through local conversions, especially via solar PV, will increase. This is where the suburbs potentially come into their own as a viable form of settlement, because it’s in these areas that the power density of supply and demand has the greatest potential to reach parity. But the opportunities here will very likely remain hidden from view if energy transition is approached principally as a technical problem of how to replace a certain number of watts of power from one source, with a numerically equivalent number of watts from another. And so a key insight that I think RetroSuburbia points to is this: if we’re serious about the transition to eco-cities, and realistic about the constraints that we need to work within—including hard bio-physical constraints of the nature I’ve outlined here—then it’s adaptations in economic ideas and related social attitudes, and perhaps more importantly still, the cultural identities that underpin these, that we will need to attend to most closely in laying down pathways to viable futures. For anyone curious, as with the event mentioned in last week’s post, I travelled to the venue by bike from my home in Melbourne’s north. Power density figures cited here are from Smil, Vaclav. 2015. Power Density: A Key to Understanding Energy Sources and Uses. Cambridge, Massachusetts: The MIT Press. This entry was posted in Energy transitions, Societal futures, Systems approach, Uncategorized and tagged cities, David Holmgren, Eco-city World Summit, economics, household, Kate Dundas, Kate Raworth, permaculture, power density, renewable energy, RetroSuburbia, Sam Alexander, social innovation, urban design, Vaclav Smil by Josh Floyd. Bookmark the permalink. Being a suburban dweller, when I first read an article about David Holmgren’s vision of retrofitting the suburbs, I was interested in what he had to say. I now find myself in the position where my eldest son and his wife cannot afford to buy a house, other than on the fringes of Melbourne, so we are considering a way of retrofitting our block so they can live here as well. I definitely feel concerned about the next generation and feel a desire to contribute where I can to reduce the stress of just ‘making a living’ today. This way we can share many resources that would otherwise be doubled if they had to set up in South Morang. It would also cut back on the amount of commuting to their respective places of employment. Hi Ruth, thanks for sharing this story. I think seeing this in terms of the compounding benefits (reduced stress, less travel), rather than just a matter of bare necessity, is important for appreciating how RetroSuburbia could work as part of a broader shift in how we understand cities and make them work (as they are now with all their imperfections, as distinct from how ideally we might want them to be). One of the counters at the summit was that people don’t want to spend all their time in the suburbs (hence commuting for work and recreation), or to share housing. I think there’s an assumption there around continued availability of choices that have been taken for granted in past. A question for me is how people choose to respond, if those choices aren’t available. I don’t think that needs to be seen only in terms of loss of something inherently valuable, which seems to be at the heart of the RetroSuburbia idea. Your family’s response to the situation in Melbourne seems to suggest that might be right.